You'd have to be living under a rock not to know: avocados are the saints of the food world right now. Praised by health bloggers, chefs, doctors, and food critics alike, the avocado is the superfood that has literally taken over the culinary world. Ten years ago, you wouldn't have found $10 avocado toast on a breakfast menu; today, the green spread is available pretty much everywhere food is sold. 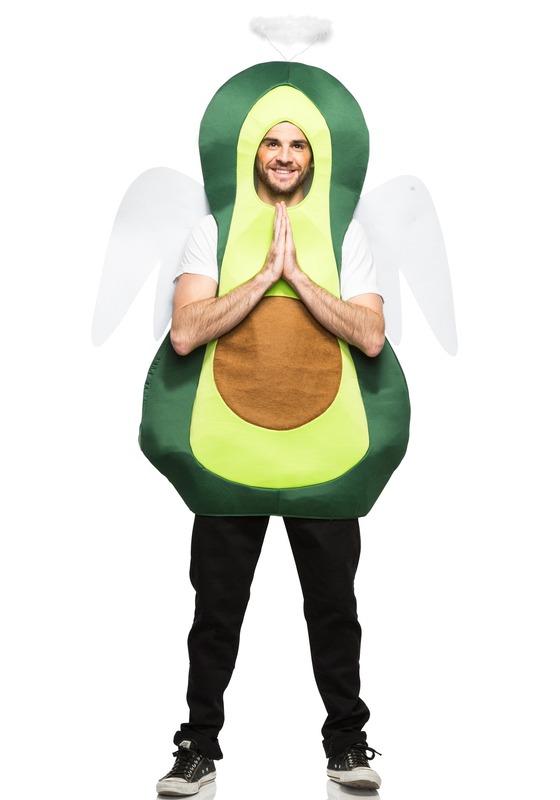 So, if you're looking for a humorous Halloween costume, this Holy Guacamole Adult Costume will poke fun at...yourself...seeing how you're known for putting avocado on everything. Your friends will get such a kick out of this look, you may even earn a new nickname, like Ace Avocado or Mama 'Mole or something else that's more clever than what we can come up with. With all that candy lying around, people could probably use a good, healthy reminder to not overdo it, and this hysterical costume may do just that! This costume is as easy to wear as it is clever! It's a tunic that's made to look like a freshly-sliced avocado half. It is almost an exact replica of the real thing, with two major exceptions: 1) our avocado probably costs as much as two real avocados at the store, but lasts a lot longer (just kidding! But seriously, avocados are so expensive!) and 2) our avocado is not going to get overripe within the span of minutes like a real avocado, which can go from hard-as-a-rock to mush in what seems like a day. The best part? Sweet white wings attached to the back of this costume make your 'mole holy! All that preaching about healthy eating and the saintly goodness that is the avocado may work up an appetite! Think about bringing your own contributions to the party—guacamole or fancy avocado toast—so you can take a break and kick up your feet when you need to recharge!